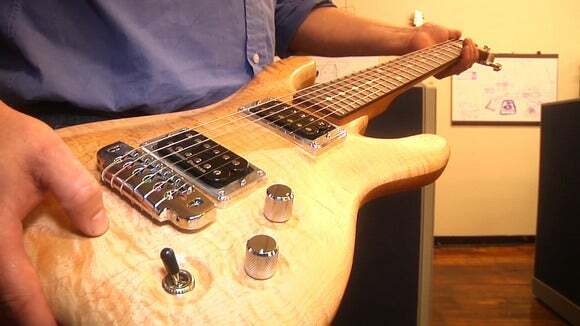 A New Hampshire design firm is using its expertise in 3D modeling and music in a new business making custom wood guitars. The custom instruments from Orphanage Guitars start with a customer’s two-dimensional sketch, but are turned into 3D models using Autodesk’s Fusion 360 software. One of the custom wood guitars from Orphanage Guitars designed using Autodesk’s Fusion 360 software. Matthew and his brother Jonathan got the idea for the business when Autodesk approached them looking for new uses for its software. The duo had used 3D modeling for other applications. Both enjoy playing the guitar and were even in a band together at one point. Redpoint Studios uses Autodesk's Fusion 360 to design custom wood guitars. “Typically in a surface modeler ... we’d have to overshoot our surfaces and then blend those surfaces together to get them just perfect,” Matthew explained from the group’s small studio, inside a renovated mill factory along New Hampshire’s Merrimack River. Without the help of the software, he explained that it would take “weeks if not months” to achieve the same results. In Fusion 360 the designers can change the material of the guitar or even the lighting to test reflections. After designing the guitar body and double-checking it with the customer, they move it over to another piece of software where the routing templates are dropped in. Then it’s off to an automated wood carver, which shapes the design from the block of wood that the customer originally chose. Redpoint Studios’ designer Matthew Harris playing one of the custom wood guitars designed with 3D modeling software. After it’s finished and stained, the electronics and strings are added. So far Orphanage Guitars has only had one paying customer through its Kickstarter campaign. The guitars cost $2,500 to $3,000, which is similar to what other high-end guitars cost according to the brothers, but these are one of a kind.